If your vehicle already has an electric fuel pump with a return line in place, you might not need to replace it. * If this situation fits your car, consider the Throttle Body Kit which comes with the Throttle Body, Power Module (with Wide Band O2 sensor), and Handheld Controller. 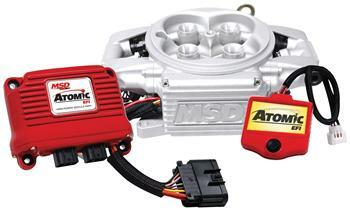 The Atomic TBI is compatible with Boost/Nitrous! *The Atomic must be controlling ignition timing in order for the Boost/ nitrous timing retards to work. Works with WET nitrous systems only. The nitrous function will not compensate for fuel on a DRY nitrous system. *For an existing fuel system to work with the Atomic, we recommend the system be able to maintain 42psi constant and use 3/8th or “Dash 6” fuel line rated for EFI. The Atomic can support a return fuel line if needed for your application.